A technician reviews video from inside storm drains. Many months of work at the future Seaway Transit Center has focused on installing a storm drainage system in the three-acre site. This week, the system’s oil/water separator was installed, then all of the filters and catch basins were cleaned. 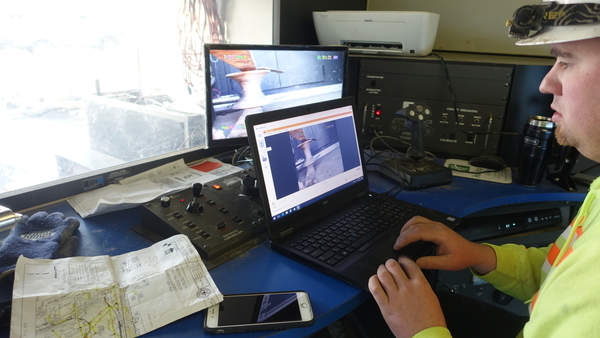 An inspection of the work is now being conducted by sending a video camera through all storm drain pipes larger than six inches in diameter, to confirm that the system is properly installed and ready to perform. Plumbing, electrical and HVAC work for the mechanical building has begun, and will take several weeks to finish. Crews have begun to install concrete footings for the transit center’s monument signs, which will be located on the corner of 75th St. and Seaway Blvd. The monument signs themselves will not be installed until the summer. Work on the power and data controls for the new traffic signals will continue to require single-lane closures in both directions of traffic on 75th St. for a few more weeks. A one-hour version of Community Transit Live will take place once again at noon on Wednesday, March 28. On March 15, more than 150 people got online to hear live questions and answers about Swift Green Line construction and the transit agency’s proposals for fall 2018 and spring 2019 service expansion and fare change. If you missed it, you can access a subtitled recording of the webcast at www.communitytransit.org/CTLive. Details for joining the webcasts are also located on that web page. We hope you join us next Wednesday — bring your lunch, and your questions and comments! View previous webcasts, provide feedback or submit questions at www.communitytransit.org/CTLive. Traffic signage has been installed over eastbound lanes before the I-5 overpass, clarifying the configuration of the new lanes for eastbound traffic. The damaged signal pole foundation located just past the southbound I-5 on-ramp will be repaired next week. The work will take a few days, with no impacts to traffic expected. On the east side, utility work continues for another few weeks as conduits are installed and connected, and a temporary wooden signal pole is installed near the existing signal just east of I-5. Water main work will require brief shutdowns of water service at a few local businesses over the next couple of weeks. All businesses will remain open during the shutdowns, and there will be no impact to traffic. Information about the 128th Street project, including an animated video demonstrating traffic flow, is online at www.communitytransit.org/128th. New Bus Pullout for Westbound 132nd St. and 16th Ave.
Construction for Swift Green Line stations has been divided into four geographical areas. Crews will complete the work in stages, resulting in each station location being visited several times (see map and related article on reverse side). Swift Network News provides the most up-to-date construction information available at the time of publication, but construction schedules are subject to change at any time. 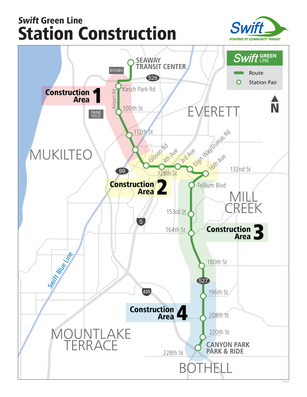 The station pair planned on the northbound and southbound sides of Bothell-Everett Hwy. at Trillium Blvd. are the only ones in Area 3 that are scheduled for work next week. Overnight (8 p.m. to 4 a.m.) work is planned for one night at each station, but will not occur on the same night. The far-right lane of traffic will be closed while work is being done. Area 2 runs along 128th/132nd St. from Gibson Rd. to 16th Ave. Next week’s work in this area includes concrete preparation and pouring, installing electrical conduits, and work on sewer lines and storm water drainage. Westbound, 128th St. and 3rd Ave. Eastbound, 128th St. and 3rd Ave. Eastbound, 132nd St. and Dumas Rd. Westbound, 128th St. and 4th Ave. Eastbound, 132nd St. and 16th Ave.
All station construction requires periodic closures of one lane of traffic. A retaining wall at the site of the future station on southbound Airport Rd. at 100th St. is scheduled for work on Sunday, March 25. The far right lane will close at 8 p.m. and reopen no later than 4 a.m. on Monday morning.